To make sure that your important documents are shredded well rather than simply discarded, shop here for the best paper shredders! 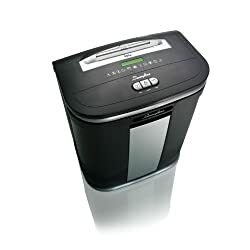 Paper shredders help to safely get rid of bills and other important documents that people may use to get your sensitive information. This information can be accidentally tossed out of your home or office with nothing to protect it. Because of that, it's best to stay organized and eliminate waste by getting a shredder to cut up those thick stacks of paper that have been sitting around your house or business. Consequently, anyone who is intentionally digging through the recycling to discover your information will have no luck. A great shredder can dice and slice through documents easily. Many will be seeking the most secure shredder possible, providing a range of specifications and features that give it the capability to get the job done and offer a long run time. Whether you're looking for the cheapest shredder or the best one on the market, this is the place to start! 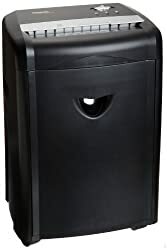 In this list, there are a large variety of paper shredders that will be able to suit your needs. Whether you're looking to invest in something with a lot of bin space or something you can run longer, you'll be able to find some of the best options here. Just make sure you keep in mind what you need as well as your budget for a new paper shredder. This paper shredder cuts through your papers in no time at all. Because of that ability, the Swingline 14-sheet is a great option for those who want efficiency. With a 20-minute run time in a small 20.5 pound package, this is certainly an efficient option. You'll be able to destroy old tax returns, junk mail and even credit cards with ease, leaving plenty of time to spare. The Swingline offers a compact size that can fit under the desk or in a corner of your office or home, giving you an easy place to get rid of documents. You'll also get a fantastic 20 minute runtime before you're alerted by the cool-down indicators telling you that it needs another 15 minutes to cool off before resuming shredding. The Swingline is built with a stylish design including a main shredder and separate cutter depending on whether you need to shred paper sheets or need the horsepower to cut through something thicker like a CD. During a single shredding session, you'll be able to shred up to 14-sheets at a time using the super cross-cut shredder for smaller paper pieces than other options. Due to the power offered, the Swingline can cut through a single letter-size sheet until it is broken into over 400 pieces smaller than a penny. Due to the compact bin size, it's able to be tucked under the machine with no trouble. Because it is on the small side, it's great for at home use. During the run time, the Swingline will even be able to handle staples and paper clips that are still attached to paper. To keep the quality at it's best, it's a good idea to remove these things but they shouldn't cause the shredder to jam or cut the power off otherwise. 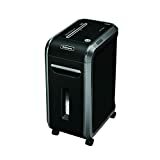 If try out this paper shredder, regard the run time very closely, as there have been some discrepancies. It's better to run it for shorter amounts of time than to risk breaking it. Some customers find a run-time discrepancy on the manual. In some cases, it can run when it shouldn’t and refuse to run when it should. For those who just need a good paper shredder for home use that offers a lot of bin space without being too big or heavy, this is a fantastic option. 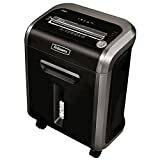 When you're looking for a micro-cut shredder than can prevent individuals piecing together your information, the Amazon shredder is great. This shredder can turn paper into 5/32” and 15/32” bits no larger than those in a bag of confetti, which is fantastic for individuals who need the shredder for extreme professional uses. The shred capacity also allows you to handle 12-sheet bundles at once, ideal for lengthy shredding sessions. When you need something suited to handling a lot of paper, this is the way to go. AmazonBasics has created a paper shredder that can turn letter-sized sheets of paper into piles of around 2,235 pieces. That's six times more pieces than you're likely to get from a traditional cross-cut shredder. It also offers a bin that holds 6.7 gallons, offering enough space to hold shredded paper as well as shredded CDs and credit cards. 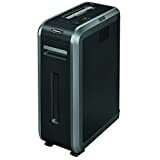 In addition, a cool down time of 45 minutes paired with the continuous eight minute run-time makes the AmazonBasics shredder excellent for single shredding sessions. It also protects the machine's motor from overheating through automatically turning it off when it's time for the shredder to cool down. Because it's on the smaller side, Amazon's 12-sheet paper shredder is perfect for tucking away into a corner. The AmazonBasics shredder also offers a standard paper feed of 9.1 inches so you can fit most sizes of paper into it. The automatic shut-off feature also gives it an extra layer of safety for good measure. Furthermore, you'll be able to use a manual reverse option that helps clear out paper jams. At 65 decibels, this shredder works at a mid-range volume that isn't soft, but also won't be too loud. The auto start also ensures it can create micro-cut shreds so you won't need to add paper constantly. The bin also holds enough to ensure you don't have to empty it often. These machines aren't perfect, so in some cases there can be some units that come out in worse shape than others, meaning that you can sometimes end up with one that stops working or jams more easily. Bin is a decent size. In some cases it may cease working after only a few months of use. Some customers have found it can jam even when used properly. Royal's 1840MX is an 18-sheet cross-cut commercial paper shredder that is a superb option whether you need it for your home or small business. With a 40-minute run time, you'll be able to shred sensitive information documents, CDs, DVDs and credit cards with ease. It's also able to consume 18 sheets during one pass, breaking it down into 5/32” and 11/8” particles that will then drop right into the 8.5-gallon wastebasket as they are shredded. The 1840MX will be able to shred down a single sheet in about 5 seconds, making it easy and quick to use in your home or office. It includes an auto start/stop to make shredding easy as well as a reverse function to help get rid of jams. While using the 1840MX, you'll get a lengthy runtime and a bin that is easy to empty out as needed. The 1840MX is a heavier device, as it weighs in at a little under 40lbs but it will be easy to slide out the waste bin so you won't have to carry around that weight. The clear viewing windows on the 1840MX will also give you the option to watch as it destroys just about anything you put into it. From time to time, customers have noticed that it can give off overload warnings when it hasn't been filled. In rare cases it may suddenly cease working. Some customers experience overload warnings when they aren’t warranted. If you're looking for a longer run time than other options and don't mind a larger-sized machine then this is a wonderful option. 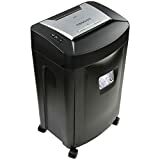 When you want a high security shredder for all your paper shredding needs, the Fellowes Powershred 99Ms is a fantastic choice. This micro-cut shredder offers a 9” wide feed slot that will allow you to shred most paper sizes into tiny 5/65” x 9/16” cross-cut bits in a single pass. Due to the tiny shreds the 99Ms is able to make, it is without a doubt one of the most secure shredder options available. Using the 99Ms, you'll be able to shred up to 12 sheets of paper as well as credit cards and more. A single letter-sized sheet will be broken down into 2,154 particles of paper, giving you a lot of security and performance. You'll also be able to operate this micro-cut shredder for up to 15 minutes at a time before it needs to be followed by a 25-minute cool down period. Because the particles the 99Ms can create are 50 times smaller per sheet than what you'd get from a standard cross-cut option, it's perfect for the business environment that has a lot of important documents to shred. Particles so small are nearly impossible for anyone to reassemble, which gives you a lot more protection than other models. It also comes with a “SilentShred” feature that will bring the decibel level down to allow for an ultra-quiet shared workspace. As an option that is a little on the tall side, the 99Ms is great for the office. It's also a heavier choice, coming in at around 63 pounds. This device is absolutely suitable for placement in the corner of an office space. Overall, it's an easy to operate machine that also offers a 9-gallon pull-out basket that makes getting rid of shredded paper easy. With 80% more micro-cut bits in this bin than you'll find with standard cross-cut pieces per gallon, you'll get great value from that space. As the ultimate in security shredding, this Fellows machine pushes what a paper shredder can do. Therefore, in this list it is stamped as the best choice for those who want security. If you're looking for something that is going to run very quietly, this may not be the best choice. May be noisier than expected. Some find that it isn’t actually able to handle 20 pages at a time. For those who are looking for a powerful paper shredder that can offer a lot of security, it's well worth giving the 125Ci a look! Perfect for large offices, the Powershred 125Ci has a bin capacity of 14-gallons. It's designed to be Security Level P-4 to ensure that paper inserted is broken down into 397; 5/32” x 1-1/2” pieces. These cross-cut particles are the result of the capability of a powerhouse of a device when it comes to shredding. 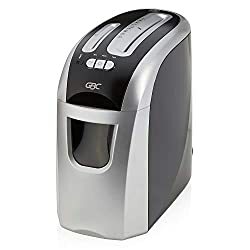 With the 124Ci, you'll be able to shred up to 20 sheets of paper as well as paper clips, staples, CDs, credit cards or other miscellaneous items in a single pass. The SafeSense technology also allows it to to sense when any hands may be touching the paper opening in order to avoid injury. The jam-proof system on the 125Ci is also very helpful when avoiding problems while shedding. You'll also be able to rely on this machine to work for 45 minutes before needing a cool down. The SilentShred feature also allows you to use the 125Ci shredder without an abundance of noise. That way, you won't have to worry about the 125Ci drowning out any chatty co-workers. While overall the machine tends to be great, the casters can be on the fragile side so be careful when moving it. Keeps up with a high amount of shredding well. In some cases it can be finicky. The wheels can sometimes break easily. If you're looking for fantastic bin capacity so that you don't have to empty it out too often, this is a great option! The AmazonBasics 6-Sheet is one of our budget favorites. It's designed for your more limited at-home shredding sessions when you just need something to cross-cut paper or that will work as a credit card shredder. Because it's in the sub-$30 price range, the Amazon 6-sheet is the ideal compact shredder for your home office. The AmazonBasics 6-sheet only weighs about 8.26 pounds, making it easy to move, but don't confuse its light weight for a lack of power. It's capable of shredding paper into strips that are 7/32 inches to 1-27/32 inches in size. You'll also get a 2-minute run time within which to use the shredder before it needs a 30 minute cool down period. Though it's small, the AmazonBasics 6-sheet still offers a 3.8 gallon bin, which is great for the low price tag. Due to the size, it's perfect for shredding things like old tax returns and junk mail as well as shredding ATM receipts you no longer need. It's a perfect, small unit with a lot of raw power and will work well in your home office or small business. Using an 8.7-inch wide paper feed, the AmazonBasics 6-Sheet will be able to detect a piece of paper or even a single credit card using its sensors. It may not offer a long shredding time, shutting off after a run time of just 120 seconds to cool down, but that's one of the tradeoffs that comes with the budget price. It is able to cut faster as a cross-cut shredder, creating confetti-like shreds but you won't get the tiny individual shreds that can come from a micro-cut shredder. This shredder does offer an automatic mode to make the shredding process a little easier, and overall offers a decent balance for those not interested in expensive shredders. It's important to be careful with this device, as it can sometimes jam more easily than you might expect. Diagonal cross-cutting feature is wonderful. May sometimes arrive in a nonworking condition. When you're looking for something small that can help with getting rid of sensitive documents then this is well worth a look. The features on HSM's 150-sheet shredder make it a solid choice for large businesses. It's made with high-quality materials and engineered to offer the most in security, energy management and durability. It's a great way to ensure documents that are important to either a company, person or institution are well taken care of. In addition, the HSM 150 is a 42.6 pound shredder, making it a larger option. It also offers a 150-sheet autofeed tray, which allows for a lot more shredding per minute than other options. The wider throat opening on the HSM 150 also helps to prevent paper jams and allow the automatic start to run more smoothly. If you choose to, you can also add paper manually to the shredder so that you can keep a closer eye on it rather than setting it to the autofeed stack processing option. Using a large 9-gallon bin, the HSM 150 will also be able to handle a lot of paper shreds. In standby mode, this system will only pump out .1watts, which cuts down on the overall power used in the office. The high security level offered by the HSM 150 paired with the micro-cut shreds it creates makes it a perfect machine for destroying confidential data that you don't want getting out. Once you start using this machine, you won't want to stop! Some customers have experienced it ceasing to work with little explanation, so make sure you have warranty information on hand just in case. Able to shred large amounts of paper. More quiet than other larger options. Can sometimes cease working after only a few months of use. On rare occasions, it can jam more easily. 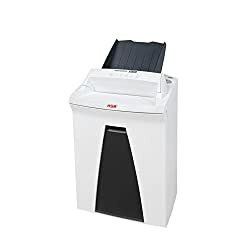 This powerhouse of a paper shredder is great for office use, so if you're shopping for something for your business then give this a look! To the Fellowes Powershred 79Ci, multimedia and paper are created equal. Unlike other models, this shredder is designed to treat CD/DVDs, staples, paper clips, credit cards and other more difficult things the same as it would paper. The 79Ci handles just about all multimedia types as a shreddable object, and has a lot of power to be able to do so. Furthermore, you'll be able to insert 16 sheets of paper per pass without a problem. The 79Ci uses SafeSense technology to ensure that this machine protects hands that are close to the paper opening. It is a 100% “Jam Proof” device so that you won't have to worry about paper jams interrupting your work. As it is a cross-cut shredder, it's also going to be able to reduce a standard piece of paper into 397 particles that are about 5/32 x 1-1/2-inches in size. All of the multimedia that is handled by the 79Ci drops into a six-gallon waste bin. Once the bin is full, you'll be alerted by an LED bin-full indicator. Due to the ease of use, the 79Ci eliminates the frustration that can come from stacks of paper building up around your work or home office. There can be some minor problems that cause some annoyance, such as paper jams and the wheels breaking too easily. 5 Different lights provide excellent feedback. There can sometimes be paper jams. If you're in the market for something that can offer you a high level of efficiency and aren't on a tight budget, this is a wonderful option. When it comes to destroying sensitive documents, the Swingling SM12-08 is hard to beat! 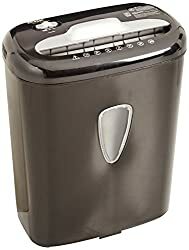 With this shredder comes the ability to shred continuously for a long period of time without the need for a break, that way you can get through those huge stacks with ease. While it can't shred credit cards, DVDs or CDs, you can get a lot of use out of this device. It also offers good security and effective jam protection to allow you to get a lot of use out of it without interruptions. For up to 20 minutes, you'll be able to use this shredder before it needs a break. The small shred size also ensures no one will easily be able to piece shredded documents back together. In rare instances, you may receive a unit that is in a nonworking condition, so make sure to keep information on the warranty and replacements just in case. Shreds into very tiny pieces. On rare occasions, customers can receive the wrong item when ordered on Amazon. It can sometimes arrive in a nonworking condition. If you're looking for a mid-size paper shredder that will be able to keep up with a longer runtime, this is worth checking out! Whether it's for yourself, an institution or a company, it's important to be able to get rid of sensitive information in an efficient way. No one wants their important documents being thrown out accidentally and discovered by those who might have ulterior motives. While you're shopping, it's important to consider whether or not you'll need to be able to shred things like CD/DVDs, staples, paper clips or credit cards as well as paper. Aside from that, the device size and your budget will be the largest factors. Happy shopping!